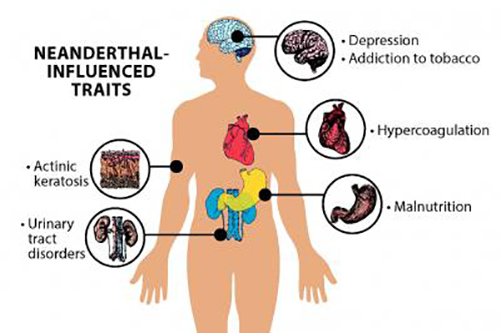 Modern humans have inherited many physical traits from the Neanderthals. John Capra, Ph.D., from Vanderbilt University, explains how many of these variants affect a variety of clinical disorders. Interestingly, Dr. Capra and his colleagues were able to confirm a few of the previous hypotheses about the influence of Neanderthal DNA on modern Homo sapiens. For instance, the investigators found that Neanderthal DNA affects keratinocytes, which help protect the skin from environmental damage such as ultraviolet radiation and pathogens. The new analysis found Neanderthal DNA variants influence skin biology in modern humans, in particular, the risk of developing sun-induced skin lesions called keratosis, which are caused by abnormal keratinocytes. “The brain is incredibly complex, so it's reasonable to expect that introducing changes from a different evolutionary path might have negative consequences,” noted lead author and Vanderbilt doctoral student Corinne Simonti. In the current study, the authors discussed that the pattern of associations they discovered suggests today's population retains Neanderthal DNA that may have provided modern humans with some adaptive advantages 40,000 years ago as they migrated into regions outside of Africa with different pathogens and levels of sun exposure. To study these associations, the scientists used a database containing 28,000 patients whose biological samples have been linked to anonymized versions of their electronic health records. The data came from eMERGE—the Electronic Medical Records and Genomics Network—which links digitized records from Vanderbilt University Medical Center's BioVU databank and eight other hospitals around the country. While Dr. Capra and his colleagues were thrilled by their findings—this work establishes a new way to investigate questions about the effects of events in recent human evolution—the researcher team also realized that there is a lot of additional information contained in the medical records, such as lab tests, doctors' notes, and medical images, that could be used in future analyses to refine their data.